In November of 2005, the Xbox 360 launched with a number of retail-based games. While the launch games were (arguably) solid, not all will be remembered as classics. But Bizarre Creation's Xbox Live Arcade title, Geometry Wars: Retro Evolved will not soon be forgotten. To this day, the XBLA twin-stick shooter still stands as one of the best values in Microsoft's digital distribution portfolio. Simple and addictive, Geometry Wars got many early adopters through those tough early times between the Xbox 360's launch and well, the release of solid titles. Now the title has gotten an upgrade, but it's not available on the system that made it famous among the masses. This time, Kuju Entertainment and Bizarre Creations have brought a full-featured version of the game, called Geometry Wars: Galaxies, to the Wii (along with a version for the Nintendo DS). But is this a case of cramming unwanted additions and complications into an already near-perfect title to make a quick buck? Or should Xbox 360 owners be seething with jealousy? 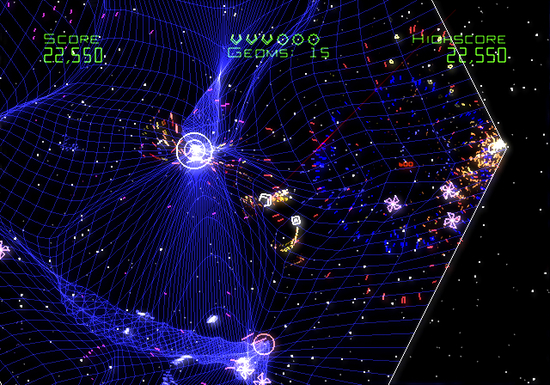 At its core, Geometry Wars: Galaxies is a lot like the Bizarre Creations title(s) it spawned from. In the simple (yet blissful) Geometry Wars: Retro Evolved, you controlled a claw-looking ship that swerves and weaves between enemies, blasting them to bits, or exploding them to pieces with your screen-obliterating bombs. Galaxies doesn't stray from that format too much, except this time you're not confined to a one area, and left to deal with endless swarms of enemies. Here, you're given multiple areas ... and you're left to deal with endless swarms of enemies. True to its name, you'll battle through ten galaxies, totaling over 60 different planets. Here is where Galaxies actually is improved over its predecessors -- its addictive nature is married to a true feeling of forward progressions. On each planet, you're given score goals that are each tied to a medal (bronze, silver, gold), giving you something to work for in each area. While Retro Evolved's playing area was an empty rectangle, the planets in Galaxies are varied and incredibly unique, with some drawing obvious influences from early 80s arcade titles such as Asteroids or Galaxian. From the first trainer planet (Traeis in the Alpha galaxy) to the more advanced planets in the galaxy of Kappa (who wants to start a Geometry Wars frat? ), the introduction of new enemies and area-types keeps the game feeling fresh. One, for instance, may have walls that move, changing how you must maneuver around the playing field. Another might have a washing machine-like gravity pool in its center, which constantly sweeps the area, pulling you, your fire, and enemies in all directions. New enemies are introduced as you unlock more galaxies, and veteran Geometry Wars players will have plenty of new baddies to deal with, like the gigantic Asteroids, which when destroyed spill out smaller versions of themselves all over the playing field. Some of the new enemies can even be helpful -- the Mine Layer, for instance, slowly moves around dropping mines; touch the mines with your ship, and they'll explode, creating a chain reaction that will destroy enemies and help you rack up points. In short, there's no lack of variety in Galaxies' level design. Another new addition is that of the drone, an autonomous smaller version of your ship which mirrors your movements and helps you blast (or defend against) enemies. Drones come in a number of forms -- attack, defend, collect, snipe, sweep, ram, turret, and bait. Drones can be purchased and upgraded using "Geoms," the intergalactic form of currency used in Galaxies, which you nab off of fallen enemies as you play. You choose your drone prior to entering a planet, and choosing the right drone for each situation is crucial to getting a gold medal or truly breaking high scores. Speaking of high scores, if you struggled with breaking that million-point mark in Retro Evolved, prepare to be shocked. Racking up the score boosting multipliers is easier than ever in Galaxies, and it's not uncommon to quickly have a 100+ multiplier if you play your cards right. This doesn't really have an impact on the balance of the game, as the target scores very clearly take this into account, but it'll be a shock for those who had worked so hard simply to get a 10 times multiplier in Retro Evolved. The added variety in level design and enemy roster are all welcome additions. While they easily could have over-complicated the beautiful and simple design of the original, everything feels like an obvious evolution to the series. Kuju did a brilliant job of creating areas and enemies that perfectly fit with the Geometry Wars universe; nothing about it feels forced or unnecessary. But for purists, Retro Evolved is also fully playable as a separate mode, and maintains all of the same enemies and scoring as the original. Galaxies also makes the brilliant (and highly demanded) choice of including cooperative and competitive multiplayer modes into the game. It plays out just liked you'd imagine -- you and a friend swerve around together, and you deal with endless swarms of enemies ... together. Competitively, each player has his or her own set of lives and bombs, and the goal is to kill more geometry than your opponent for a higher score. Cooperatively, you'll share bombs, lives, and your score; for an advanced player, playing with a novice does become frustrating as they'll often blow all of your bombs and lives within the first few minutes of gameplay. As if Geometry Wars' hectic pace weren't confusing enough, having two firing ships on the screen could become a nightmare for some. Each player has a unique ship shape and slightly different color, but there's just not enough to distinguish the two from one another, especially with everything that's happening on-screen. Moving your eyes away from the screen or your ship for even a moment can result in some serious frustration, and is a good way to quickly lose a life. The cooperative modes are certainly fun (more so than watching a friend play a single game of Geometry Wars for two hours), but it's a shame they can only be played locally -- the game does support leaderboards via the Nintendo Wi-Fi connection, but there are no online multiplayer options. As a game, Geometry Wars: Galaxies is a fantastic package, and with all of the single-player and multiplayer editions, is the best version of the game yet. However, there is one thing that's keeping Galaxies from truly being perfect -- it's on the Wii. Now I know I'm going to draw some heat with that statement, but allow me to explain. Geometry Wars, by nature, is a twin-stick shooter. Kuju did an admirable job of translating that to the Wiis controls, and for the most part, it works ... kind of. You use the nunchuck's analog stick to move the ship about the screen, which not only feels familiar, but feels right. Firing with the Wii remote is another story, although it sounds simple -- just make a slight movement with your wrist in the direction you want to fire. The problem is that it's simply not accurate enough, especially when dealing with crowds of enemies that are approaching from all sides at high speeds. It's not uncommon to want to fire right, but the game is translating your Wii remote motions into your ship firing upwards. There is an on-screen reticule to make things easier, but keeping track of another thing in a game that already overloads your senses doesn't quite work out. After spending some time with the controls, you'll find that firing becomes easier and smoother, but it's extremely difficult to get the accuracy you'll need in tough situations. It's fortunate that game also supports the Wii's Classic Controller, which has dual analog sticks, so the game can be played the way it was meant to played ... like Robotron. Even with the Classic Controller, there are problems. For starters, if you don't already own one, it's going to cost you an additional $19.99 to play the game "properly." But simply put, the classic controllers' analog sticks don't translate well to twin-stick shooters. Movement and firing in all directions requires quick and smooth movements, but the eight directional notches that surround the analog stick make that a bit difficult. Rolling the analog stick in a circle, you're going to make frequent "stops" at each of those notches, making accuracy and speed a problem. It's possible to play, and most definitely better than the Wii remote alternative, but it's nowhere near as comfortable as playing with an Xbox 360 controller in your hand. Even with slight control hurdles (and me wishing I could play it on the Xbox 360 because of this), Geometry Wars: Galaxies is an amazing enhancement to an already amazing arcade game. The MSRP of $39.99 might turn off some when compared to the $5 Retro Evolved costs on Xbox Live Arcade. The truth is, Galaxies is as addictive as ever, and well worth the extra money for fans of arcade-style shooters looking to sink hours into breaking high scores.